Gist writes with her stellar story telling talent, however this book did not excite me the way Maid to Match and Bride in the Bargain did. I’ve spent some time trying to figure out why and the only thing I can figure out is that I didn’t care for the bird side of the story which is an important component to the book. Despite that, I have to say that Gist has believable and very likeable characters. Sometimes a book will capture you from the start and not let go of you. Gist usually does that for me, just not this time. The more I think about it, it is because of the birds. I love birds but I guess I don’t have the passion that a true bird lover would. So don’t dismiss this book because of my review. You may find you enjoy it cover to cover without stopping because Gist is a fantastic storyteller. Book provided for review by publisher. It's a Battle of Wills ... and Love Is on the Line! world . . . which makes it twice as vexing when the telephone company sends a man to look over her shoulder. Deeanne Gist--known to her family, friends, and fans as Dee--has rocketed up the bestseller lists and captured readers everywhere with her very original, very fun historical & contemporary romances. Add to this three RITA nominations, two consecutive Christy Awards, rave reviews, and a growing loyal fan base, and you've got one recipe for success. She has a very active online community on her website at IWantHerBook.com and at Facebook.com/DeesCircle. Deeanne is thrilled to introduce Georgie and Luke to the word in her latest novel, Love on the Line. 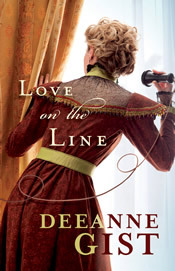 To celebrate Deeanne's publisher, Bethany House, is hosting the Love on the Line iPad2 giveaway an Author Chat on Facebook! Enter today and follow the link below to RSVP for Deeanne's rip-roarin' Facebook Party! Enter today by clicking one of the icons below. But hurry, the giveaway ends on November 7th. Winner will be announced at Deeanne's Author Chat Facebook Party. Deeanne will be wrapping of the Love on the Line celebration by chatting with friends new and old! So grab your copy of Love on the Line (it's okay if you don't have one yet- you might could win one!) and join Deeanne on the evening of November 8th for a rip roaring book chat, a little trivia, a sneak peak at her next book, and lots of giveaways (books, and Amazon, iTunes & Starbucks gift certificates)! Don't miss a moment of the fun. RSVP today and tell your friends. Hope to see you on the 8th! "Love on the Line" is a masterfully written tale with excellent wordsmithing, characters that I just fell in love with and sizzling moments of romantic tension. The writing of a Deeanne Gist novel always pulls me by the throat into the story. It's descriptive, sometimes even funny, charming, beautiful, paints a picture in your mind's eyes with so few words needed.